A little more than 18 months ago I met Cheryl. While I felt drawn to her when she first joined our Relief Society meeting, I had no idea how much her friendship would bless my life. Cheryl is one of those women who has more BIG problems to deal with than most of us do. And by big, I mean real, hard, obvious things, things that if she listed for you, would make you feel amazed that she hadn’t quit long before, and even more amazed that she wasn’t allowing every waking minute of her days to be defined by them. She has every reason to be a victim, to be cynical, negative, unhappy. Except that she isn’t. She is amazing. I learned so much from her during the months that she lived nearby. Being around her filled me with a desire to be better, to carry my own challenges more gracefully, to resist internalizing them so much, or letting them define me. I’m so, so glad that we met and became friends. She moved away last summer, and so I made her a quilt. 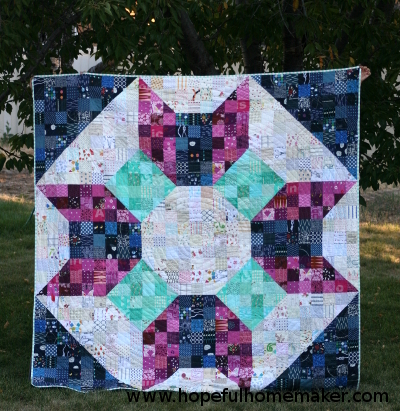 It’s a huge, scrappy version of my Wishing Well (or Prosper) quilt block, much like my Scrappy Swoon from years ago. The purple and navy are colors that remind me of her, and the aqua I added because it’s me. I particularly love the scrappy low volume background. 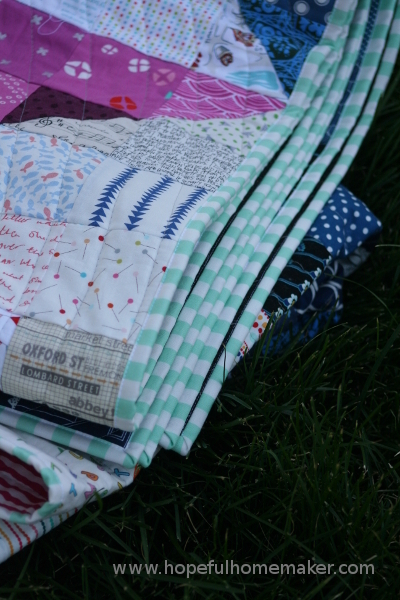 Lots of different fabrics in this quilt! 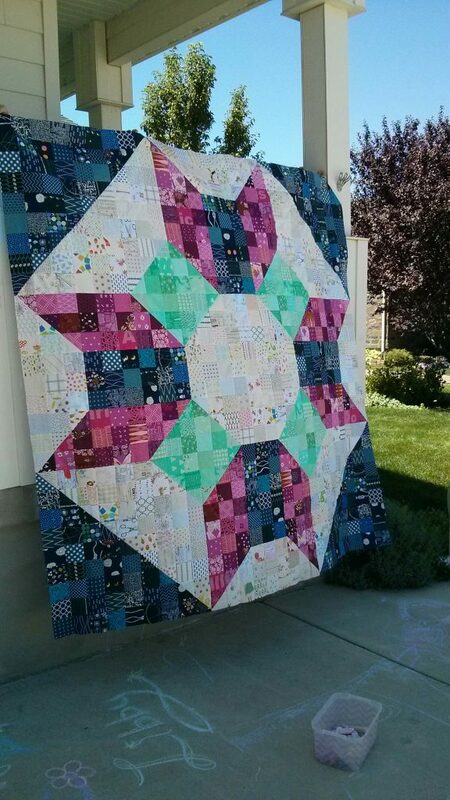 The quilt measures about 81″ square, and I quilted it on my domestic machine in a spiral. Not the easiest task, but it worked and I like the results. The binding is a soft white/aqua stripe that compliments the quilt nicely. 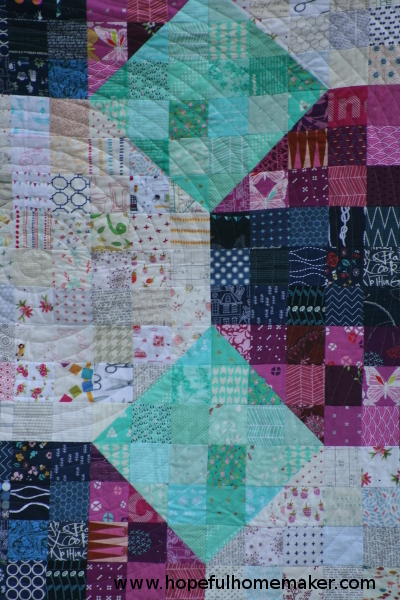 I’m grateful to have a few photos of this quilt. I know it’s being used and loved in its new home, and that makes me very happy. What a work of heart…. Do you know I sleep under the quilt you made me every night? Little bits of love and sweet memories tuck me in and lull me to sleep. Neil marries in the Provo temple on your birthday; I hope to share a moment of birthday happiness with you, too.